A raft of community initiatives are being discussed as part of plans to build a further 218 new homes in County Durham. Apprenticeships, training, work placements, school projects, road and footpath improvements are all on the agenda for the Durham Villages Regeneration Company (DVRC) as it starts building in Dipton and Peterlee. A partnership between the county council and UK homebuilder Keepmoat Homes, DVRC has a track record of supporting the communities in which it works. Committed to supporting and enhancing the communities in which it works, Keepmoat Homes North East was awarded the Heart of the Community accolade at this year’s 2018 North East Business Awards. Proposals under consideration as a result of these latest developments include new work placements for students from Derwentside and East Durham Colleges, which could lead to apprenticeships, as well as construction based workshops and presentations. Further backing for the East Durham Trust’s ‘Yes You Can’ employability programme is also to be discussed — including advice on CV preparation, interview skills and the kind of qualities employers seek. Support for local schools features heavily in the plans too. For the Dene Primary and Community Schools in Peterlee, there are proposals to help implement a travel to school plan for pupils to complement the improved road and footpath access to the sites. In addition, for the primary pupils, the options include a project on safety — including a poster competition — and a site visit, whilst for the secondary students a project on construction with careers information and advice is being considered. At Dipton, construction of an outdoor changing area is proposed for the Collierley Primary School, with the support of students from Derwentside College, providing them with a ‘real life’ project away from the classroom. Similar initiatives are expected to flow from a DVRC project at Gibside in Chester-le-Street, where planning permission has recently been granted for 78 homes. It is hoped the proposals will be agreed and implemented as the construction of the 59 homes at Dipton, 84 at Peterlee and 78 at Chester Le Street takes place. All these sites are part of a £89m investment in 636 new homes by DVRC in County Durham. Other current developments are at Middlestone Moor, Newton Aycliffe, Seaham and Sherburn Hill. Since formation in 2001 DVRC has invested more than £150m, creating over 1,300 homes — around a quarter of which are for shared ownership or affordable rent. A unique profit sharing agreement has also provided funds in support of local authority initiatives and services. 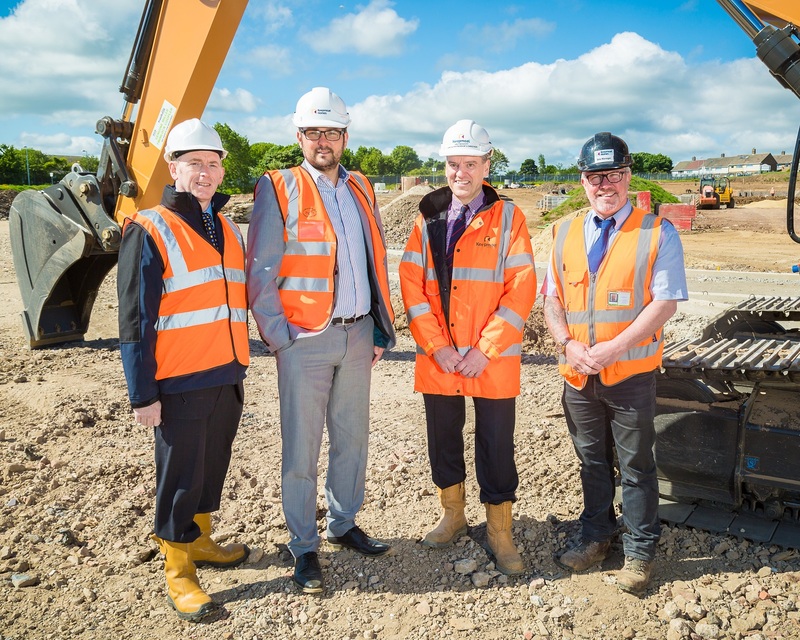 Pictured at the Peterlee site, from left to right, are: Graham Wood, Economic Development Manager at Durham County Council; Cllr. Carl Marshall; Ian Prescott and Rob Rudd, Keepmoat Senior Site Manager.